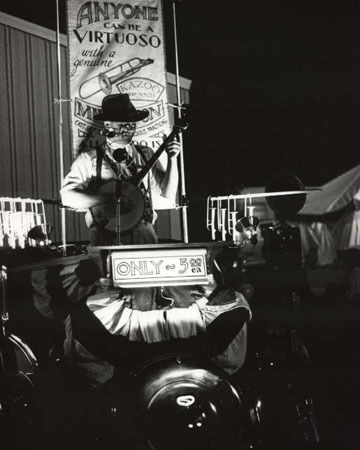 "There is one performance image of me working the medicine show at a small fair with a stage I built in the rumble seat of a 1933 Plymouth. The seat cover opened up and a podium and backdrop folded out. I then stood in the area were the seat used to be, facing the rear of the car. I clamped on electric lights powered from the battery of the car."